àMaurice Cellars is a family-run winery located just east of Walla Walla. Founded in 2004, the winery is dedicated to Maurice Schafer – the Schafer family patriarch “who was known as a gentleman, guiding light and civic leader.” The Schafer family’s interest in starting a winery was formed around the dining room table. Reflecting this, àMaurice Cellars makes wines to be enjoyed with food. Maurice Schafer’s son Tom spent two years researching the Walla Walla Valley before deciding on proper place to plant their vineyard. Established in 2006 and now in its fourth leaf, the thirteen and a half acre vineyard is planted to Merlot, Syrah, Cabernet Sauvignon, Malbec, Viognier, Cabernet Franc, and Petit Verdot. 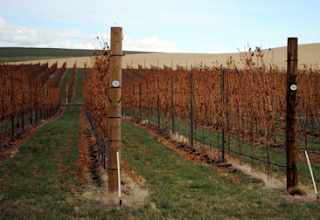 Located by Mill Creek, the vineyard is situated 1,400 feet above sea level, higher than most in Walla Walla. This elevation and the proximity to the Blue Mountains afford the site twenty inches of rainfall per year. Considerably higher than the average valley rainfall, the Schafers rarely need to irrigate during the growing season, unlike most valley wineries. Schafer’s wines are simultaneously bold and nuanced, adding to any meal but also standing on their own. While the estate vines mature, àMaurice sources fruit from Gamache, Sagemoor, Weinbau, Connor Lee, Elephant Mountain, and Boushey vineyards. However, even at their fourth leaf, the estate vines show great promise. The 2008 Viognier from this vineyard – Sparrow - is one of the best I have had from Washington State. While this wine has extremely limited production, the Columbia Valley Viognier is not far behind. àMaurice produces 3,000 cases of wine annually. Wines sampled at 61 degrees except where noted. Rating: * (Excellent) Pale straw colored. Loaded with stone fruit and floral aromas. Crisp and clean on a beautifully balanced palate. 100% Viognier. Neutral barrel fermented and aged. 14.1% alcohol. 294 cases produced. Sampled at 55 degrees. Rating: * (Excellent) An explosive nose marked by violets and smoke. Chalky, dry, and redolent with red fruit on the taste. 85% Syrah, 15% Grenache. Lewis, Boushey, and Minnick vineyards. Aged in 100% French oak (2nd fill or older). 14.1% alcohol. 231 cases produced. Rating: * (Excellent) Floral notes, spice, and pepper mark an expressive nose. A beautifully restrained palate. 100% Malbec. Gamache and Stone Valley vineyards. Aged in 100% French oak (30% new). 13.9% alcohol. 244 cases produced. Rating: * (Excellent) Earth, pepper, floral notes, and sweet ground spices on an engaging nose. Loaded with savory fruit on the palate. An impressive effort. 40% Cabernet Sauvignon, 28% Merlot, 24% Cabernet Franc, 4% Malbec, and 4% Petit Verdot. Aged in 95% French oak, 5% Hungarian. 14.4% alcohol. 342 cases produced. Rating: * (Excellent) Pale straw colored. An absolutely gorgeous nose with crisp pears jumping from the glass along with a bouquet of flowers, tangerines, and peaches. So many layers of complexity one stops counting. Perfectly composed on the palate with a textured weight while remaining dry. An acidic zing at the finish brings it home. Perhaps the best Washington Viognier I have had. 100% estate Viognier. Neutral barrel fermented and aged. 37 cases produced. Sampled at 50 degrees. 2008 Sparrow provided as a bottle sample by the winery. Sean - where do you find the time for such amazing compilations and reports on these wineries? It's one thing for the writing, but you obviously travel there too! WOW! From your description, I WANT the Tsutakawa! Josh, I'm considerably worried about finding the time after hearing that days got one millionth of a second shorter after the earthquake in Chile! Hope this doesn't break your heart but an astute reader just pointed out that the price I had listed for the Tsutakawa was incorrect. The correct price is $35. I have changed this above.